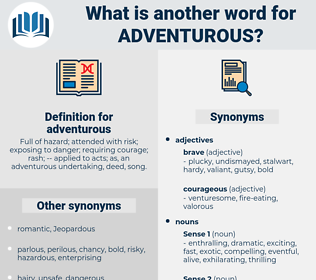 What is another word for adventurous? Full of hazard; attended with risk; exposing to danger; requiring courage; rash; -- applied to acts; as, an adventurous undertaking, deed, song. enterprising, risky, aggressive, risk-taking, ambitious, hazardous, challenging, dangerous, valiant, gallant. courageous, daring, bold, brave, fearless. fearful, cowardly, prudent, unadventurous, timid, cautious, meek, careful, shy, weak. heedful, scared, calm, terrorized, horrified, spooked, fainthearted, craven, overcautious, terrified, sage, startled, unnerved, cool, worried, unenterprising, milky, rational, faint-hearted, alarmed, cringing, coward, overcareful, sensible, lily-livered, wary, wise, sound, chickenhearted, poltroon, shocked, pusillanimous, sane, Affrighted, upset, levelheaded, frightened, Milk-livered, appalled, concerned, shrinking, afraid, dismayed, reasonable. The marines and soldiers, however, got their muskets ready to pick off any more adventurous foes who might for an instant appear among the trees, but the enemy were too well accustomed to this sort of warfare to expose themselves, and kept well under cover. Adventurous projects succeeded each other in his thoughts.